I encourage you to burn this to CD or copy it to your mp3 player and listen to it as you drive, as you exercise, as you go about your day, every day for a month, or more. Even if you have heard a copy of The Science of Getting Rich before, this one is different. This is my recording of the classic text and is different, because there are different inflections in my voice than any version you have heard before. These all are picking out different meanings and ways of seeing things (remember, I’m a hypnotist, I know how to make things influential) and the more ways of seeing things you have, the more flexibility you have. This recording of The Science of Getting Rich is different, therefore new (While being the same, the exact same text that Wallace Wattles wrote over 100 years ago). It will impact your beliefs if you listen to it everyday for 30 days. Listen to it regularly after that until you can recite alongside it word for word and until you can quote it and find yourself saying things from the book. It’s then that you will have changed some mindsets around wealth. You will have taken your first steps to changing your mindsets around wealth that will see changes in your behaviour that will lead you to riches. 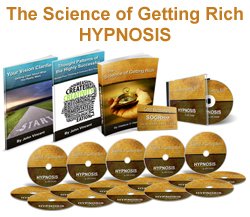 To dramatically and quickly change your mindsets around wealth I created The Science of Getting Rich Hypnosis system a 17 hypnosis session and members site system, based on the classic text and designed to reprogram your mind for wealth. © 2011 The Science Getting Rich Mp3.